And in that year, one score and no more ago, Abraham Lincoln and the Suzukiites came down from the mountain with the Hayabusa tablets, which received huge play because that bike went 186 miles per, and because the world’s moto-VIPs (including yours truly) got to not only ride the coppertone missile that fast on the Spanish main, but also around Circuito Catalunya – and it was a big deal in a time when speed was all the rage, the world had not completely gone to Hell in a handbasket, and run-on sentences could go on for entire paragraphs with no one really caring or even noticing. 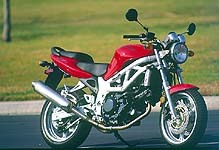 Quietly, via the backdoor, Suzuki also introduced a new midsize twin-cylinder standard that year. Rather than just write a glowing review, King of the MOites Brent Plummer wandered in the desert for months to come up with this, which I think was his malcontent version of a glowing review. rounds, flirt with the Aprilia girls, ride back to L.A. and perhaps catch a movie.Suddenly the convention doors open and consumers fill the Suzuki exhibit. Primarily they congregate around the Hayabusa. The Editors join the crowd. “It’s not as fat as it looks in pictures,” said one Editor. A large, pot-bellied and pale-faced man sporting two days of facial stubble and an Anaheim Angels baseball cap spoke loudly, ostensibly to his friend, a small, nervous man with an extraordinarily large head, dressed in a blue windbreaker and grey, stonewashed jeans, although in actuality the loud, fat man lectured to the assembled throng, making sure his opinions are heard. 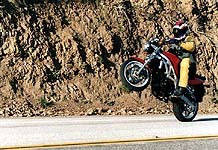 With generous torque wheelies are too tempting. One of the Editors rushed forward. “Hey, I could buy one, even on MO’s salary,” he said excitedly, although as his mouth was forming the words he realized that he in fact could not. Reality rarely enters through the front door, instead preferring to slip unannounced through an open window. “It’s naked,” said the other. A few months later, one of the MO Editors arrived at the American Suzuki headquarters in Brea, California to pick upa GSX-R600 for their 600 Supersport Shootout. The Suzuki Press Representative, not the one at the Long Beach IMS show but the one who, because of his job description, is forced to work with the enthusiast press on a daily basis (not necessarily a more desirable fate than attending trade shows), helped load the bike. They talked about the upcoming Hayabusa intro in Spain, one to which MO was not invited (not that it was any surprise since Suzuki has invited MO to only one other intro in the magazine’s four-year existence). That fact didn’t necessarily sit well but the MO Editor has always found the Suzuki Press Rep to be a considerate, pleasant and agreeable fellow. Besides, the Press Rep doesn’t decide who to invite for world-wide intros. He does, however, plan and organize American Suzuki intros and he’s invited MO to attend one for the SV650. 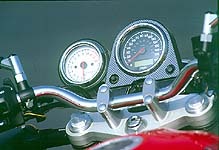 “Hmmm …” mumbled the MO Editor as he wrapped a soft-tie around one of the Gixxer’s handle bars. The MO Editor nodded politely and held out a hand toward the Suzuki Rep.
As MO Editor finished compressing the forks and tying down the bike the Suzuki Press Rep produced a liability release for the Editor to sign. SV650 sans fuel tank cover and seat. Doesn’t look much different, does it? The technical briefing was instructive, if for no other reason than it allowed Suzuki the opportunity to stress that the SV650 is not a downscale TL1000S knock-off but an entirely all-new model designed from the ground up that, of course, incorporated lessons and technology from the TL projects. 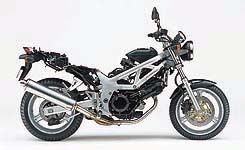 Although it’s not incorrect to describe the SV650 as a naked, downscale TL1000S, it’s not entirely accurate either. 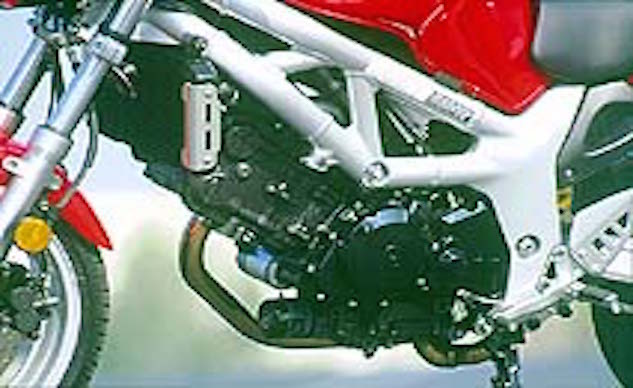 True, the 645cc liquid-cooled, 90° V-twin engine borrows more than a few bits and pieces from Suzuki’s high-performance TL bikes such as lower exhaust cams and triangularly arranged crank and transmission shafts to reduce engine height and length, a rear cylinder head pipe that routes through the swingarm, an internal water pump, and all-electric instrument gauges. But the SV650 also receives a few new tweaks of its own, such as an oil guide that sprays oil directly on the gear faces. The SV650 also receives two 39mm Mikuni downdraft carburetors instead of fuel-injection, but considering the glitches we’ve experienced in the past with Suzuki’s EFI, carburetion isn’t that bad of an idea. The rear carb is fitted with a throttle position sensor that can be used to adjust ignition timing to suit riding conditions. An adequate space to smuggle, er, transport your valuables. Certain design elements were incorporated to make maintenance easier. The air filter can be removed with a Phillips screwdriver. 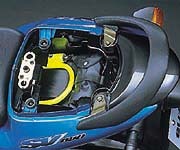 The outer clutch cover is plastic, which also helps reduces noise. Another design trick to assist in simplified maintenance is a 4.2 gallon gas tank that, similar to the hood of an automobile, pivots up and stays put with the help of a small prop stand. And, as on many Suzuki motorcycles, the passenger seat is easily removed with a key and has enough room to fit a small tool kit and a U-lock. At a claimed dry weight of 363 pounds, the SV650 is light, something that was appreciated by the MO Editor as he loaded the bike into the MO van. Since it’s naked and sports a handlebar rather than clip-ons, it’s also easy to tie down. As the MO Editor was about to drive away, the Suzuki Press Rep waved him aside. “Sure,” said the MO Editor as he swallowed hard. “Yeah, the altitude.” The MO Editor took another bite of a muffin, forced another difficult swallow, waved good-bye and drove away. One week, two calls to the HMO, three hospital release-form signatures and a couple of prescriptions for steroids and Benadryl later, the MO Editor was sufficiently recovered from whatever it was that almost suffocated him, to suit up and go for a brisk ride through the Malibu coast mountains.